For shoppers, the lines between online and offline have blurred. Last holiday season, more than half of Canadians used four or more channels to shop in a given 48-hour period. The consumer has become the channel—and that changes a lot for marketers. Here are six tips for the season ahead. Holiday shopping used to mean getting up at the crack of dawn on Black Friday, driving to a crowded store with your fingers crossed, just hoping the pair of navy blue all-weather boots your mom wanted were still on the shelf. Thankfully, those days are long gone. Now, consumers can check sizes, colours, and yes, what’s in stock before they make a trip to the store. Or they can just order those boots (and throw in a pair for themselves) with a couple of taps on their smartphones. Tips: Be ready early and maintain interest. Retailers that are unprepared for high volumes of web traffic may experience lost impressions, site crashes, or insufficient online inventory. At least three weeks out, ensure that your inventory is ready to go and that all product listings are up to date. Maintain interest throughout the holiday season by offering unique daily deals. This will prevent you from running out of inventory and will keep consumers coming back. Make sure you direct digital shoppers to stores when ship-by dates pass or digital offers run out. Organizations that leverage consumer behavioural insights outperform peers by 85% in sales growth and 25% in gross margin.5 Most companies still look at internal data, third-party data, and intent signals (from Google Search and Maps) in silos. When all that data is looked at together, marketers can uncover invaluable insights about who their best customers are and how to create better experiences for them. Tip: Leverage audience solutions. Use Customer Match to serve your most valuable customers with personalized messaging, or use Similar Audiences to find new high-value customers who behave like your best customers. From shopping via search to shoppable images and videos, the increasingly shoppable web is removing the friction that consumers sometimes face between discovery and fulfillment. Use product inventory feeds to ensure all of your inventory remains present across the web. Digital shopping ads that feature your inventory can deliver information your customer is looking for, increasing the chances of them clicking on your ad. Tip: Promote your in-store inventory. If you don’t sell your inventory online or if you just want to drive customers to your physical store, local inventory ads can showcase your product and store information to nearby shoppers. Even on a big in-store day like Black Friday, we still see shoppers searching online. In 2016, 43% of retail searches on Black Friday happened on mobile.6 What’s more, one-third of all in-store transactions last holiday season were preceded by a related mobile action.7 So even if you’re not seeing direct conversions, your mobile site is still creating value for you. Mobile offers the most powerful opportunity for personalized, assistive interactions both online and in-store. Tip: Leverage mobile solutions. Connect mobile users to your store by using location extensions and applying bid adjustments to bid higher for users near your physical store locations. 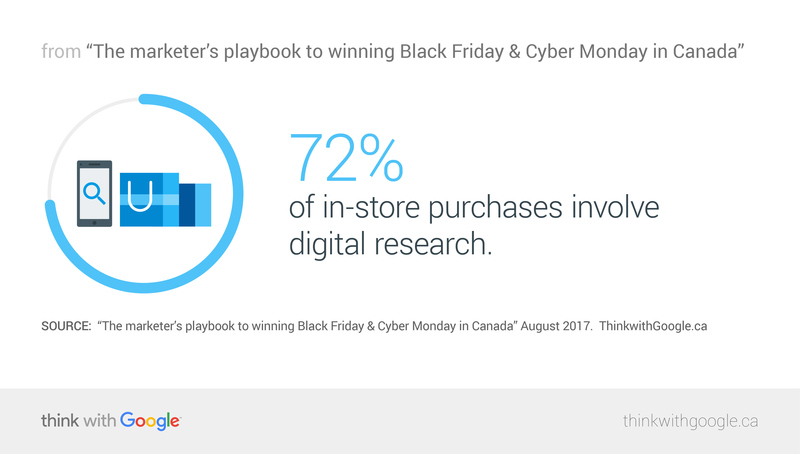 Consider this: 72% of in-store purchases involve digital research.3 That means marketers need to be both nimble and analytical as they learn more about the shopping habits of today’s Canadian consumers. Being able to measure the whole customer journey will lead to better results and help you determine the most valuable consumer touchpoints and experiences. New measurement tools can offer a more holistic view of the consumer journey beyond last-click attribution. Tip: Understand the impact of different touchpoints. Store visits can accurately estimate the number of users who saw a brand’s online ad and actually visited a physical store location. Use store visits to optimize your digital campaigns and drive consumers into stores. Mobile is making it easier than ever for consumers to find offers and compare deals, encouraging shopping throughout the year. In fact, 22% more mobile shoppers in the U.S. visited retailers via Google in the January after the holiday season than in the October before.8 For certain categories in the U.S., like furniture or home and garden, January visits increased up to 39% from October.9 Adjust your strategy to expand your reach to shoppers beyond the holiday season. Tip: Remarket to holiday shoppers. Create a remarketing list of previous visitors and optimize your shopping bids to reengage your most valuable customers. 1 Accenture, “Canada Holiday Shopping Survey,” September 2016, Base=consumers across Toronto, Montreal, and Calgary n=1,500. 2 Google/Ipsos, “Canada Shopping Study,” 2016, n=2007 in-store holiday transactions. 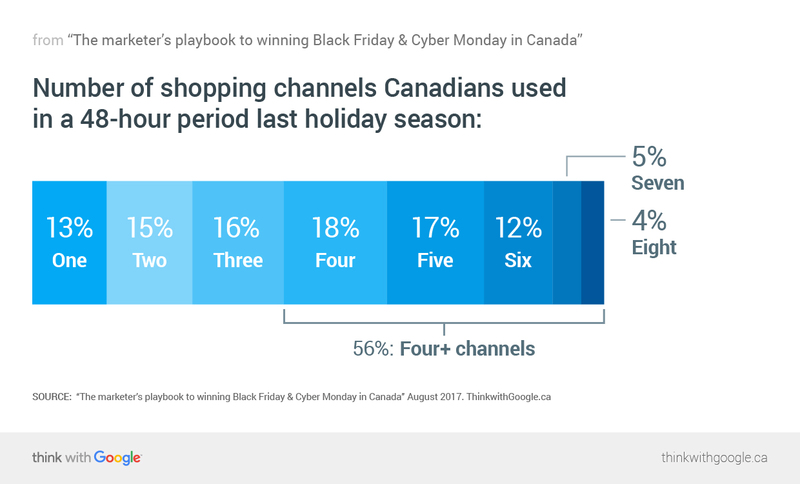 3 Google/Ipsos, “Canada Shopping Study,” 2016, n=2,730 holiday shoppers using 1+ channel in 2016, n=1,930 in 2015. 4 Google Internal Data, 2015 vs. 2016, Canada. 5 Gallup, “Maximizing the Emotional Economy: Behavioral Economics,” 2017. 6 Google Internal Data, 2016, Canada. 7 Google/Ipsos, “Canada Shopping Study,” 2016, n=2,007 in-store holiday transactions, n=1,479 online holiday transactions. 8 Google Internal Data aggregate mobile traffic October 2015 and January 2016, U.S.
9 Google Internal Data aggregate traffic by category October 2015 and January 2016, U.S.